July weekends are supposed to be full of pool parties and refreshing cocktails, but the truth is we still have to go to work during the week. Nothing is better than versatile apparel that keeps you comfy and sophisticated in the busy summer days of July. With that in mind, I'll present a casual yet chic summer-proof look to prove that shirt-and-shorts can have a creative side. And, in the Splurge section, you'll see that a comeback can be both fun and luxurious. Runway Report: The perfect shirt and shorts combo can sound a little bland, but Paul & Joe prove us wrong. 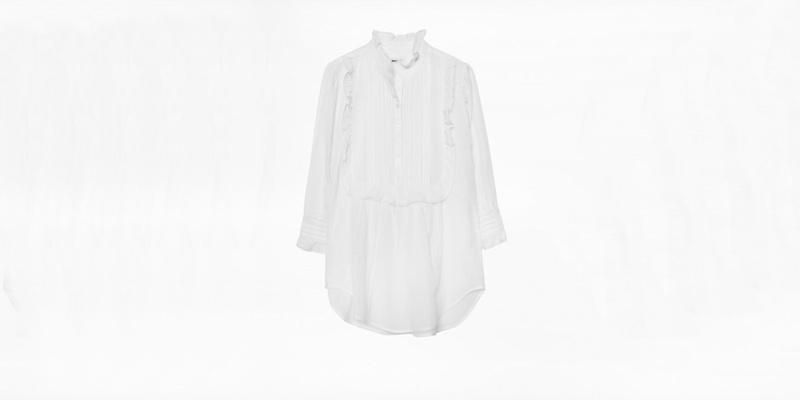 Mixing romantic ruffles and unexpected patterns can turn casual into chic, and you can start by bringing some volume to your upper body with a white shirt that has some texture, like this Zadig & Voltaire white tunic with a ruffled twist ($280). 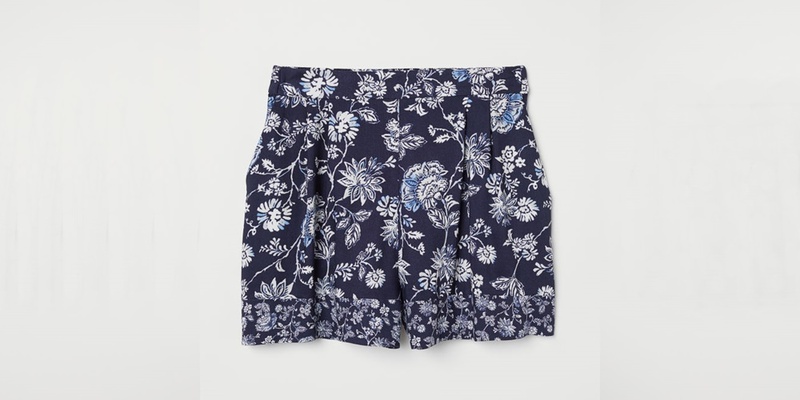 Match your shirt with patterned shorts that will set a summery tone, like these H&M blue patterned shorts ($15), which are also light to wear. Finish with a choice of flats that are patterned but not too bold, like these Nanette Lepore flats ($60), and you’ll have an informal, stylish summer-proof look. What makes this combination captivating is the mix of textures from the shirt, colorfully patterned shorts, and floral shoes. The outcome is an effortless transition between professionalism and summer fun. Splurge: The 90s were rife with clear handbags, but now this see-through accessory is back! If you search in your memories you might remember how practical and easy to clean they were, but in 2018 they’re not made to accommodate your beach towel and sunscreen. Fun, and sophisticated are the words to describe 2018’s clear handbags. You can choose a shopper style from Prada ($1,000), or one like this Staud clear bag ($200) that, although clear, still keeps the mystery of what’s inside to go shopping or even traveling. If you prefer one to carry to work, you can’t go wrong with a Chanel ($3,000). 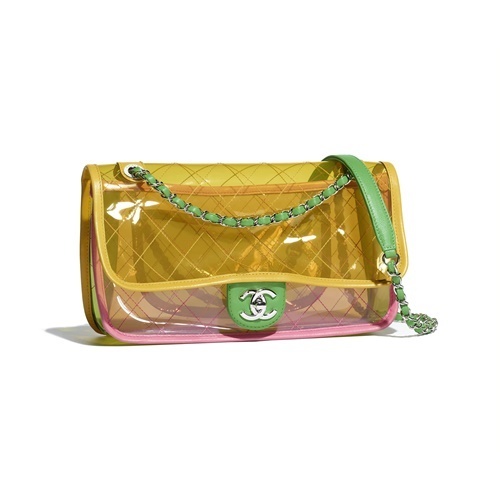 From Chanel, you can also buy their traditional flap bag ($3,000) in a clear version that will be a compliment-getter. Also, remember that nothing is more satisfying than knowing that unexpected rains aren’t a problem anymore. Summer days are long and fun. They're also opportunities to play with patterns and textures to create an elegant look for casual coffee shop meetings or long days of work. Summer is the season to have fun and be bold: why not invite that feeling into your style? Accessories can help you bring the party to every situation. While waiting for Saturday, a clear bag or floral shoes can be the styling choice you need to add fun to your sunny days.